Um, I kinda want this. 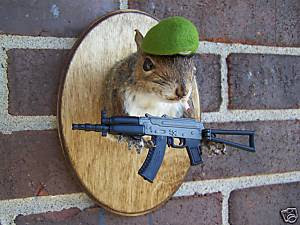 Is that nutty? Can there be any lovelier combination of two words than SHALL and ISSUE??? Thursday the info site flipped over from "processing application" to "license issued or certificate active." Hey dad - look at this! Conde Nast magazines are feeling the pinch, it would seem. I have here previously bemoaned the sad political flogfest Vanity Fair has become under the heavy hand of Graydon Carter. In old days, when the new VF arrived, I'd tear into it and spend an afternoon with an iced tea reading my way through. However, after 15+ years as a subscriber, I recognized I could no longer support GC's poltical proselytizing, despite the occasional levity of Christopher Hitchens and a few non-politically oriented delights. I've dropped nearly all my subscriptions and once read, most magazines find their way to the trash in my house these days. Of course, Vanity Fair was the first one I actively chose not to renew. It's interesting to me, then, to see Vanity Fair's ad revenues have declined by 15.5% last year. This can not bode well. Then again, maybe their advertisers have grown tired of the DNC mouthpiece, or perhaps their customers have let them know they are tired of it. In any case, I'm well out of it. Um, what's not to like? The *squeee* was added by me, by the way. Anyway, as I said, I loved the book. Good pacing and action kept this an enjoyable read, but then, at the very end, the author referenced a most profound poem, and I was mightily impressed. Yeats had some kooky ideas, but The Second Coming seems eerily prescient. He believed the world was a gyre, a great spiral which would become increasingly unstable until-- at the end of the second millennium-- things would hie themselves to a fiery place in the conveyance of a woven basket. Turning in a widening gyre, the falcon flies up and away from the falconer and cannot hear him call for the return to its base. The falcon and falconer represent the primitive self and the intellect, with the former no longer governed by the wisdom of the latter. Things fall apart, the centre cannot hold. A structure with no core can not be stable. The wild outward spirals of the falcon only make for more instability. What a mess. Then again, Yeats was living at the end of a century, and in such times, people always consider their moment pregnant with gravity and potential for as-yet-untold degrees of horror and misery. Probably means nothing at all, but it sounds mighty pretty. Stop me now. I'll type for hours. Anyhoo. What was the point? Oh, yeah: read The Dresden Files. You'll like 'em. I hope it gets him the job as the head of FEMA, too. Monday was delectably dreary- *bliss* - so I was much in the vein to go to the cinema. Various folk told me I could see a film where Nazis get shot. No, no, no, sez I - I don't want to see some Nazi drip-fest. So I unwittingly went see The Reader starring Kate Winslet and Ralph Fiennes at the local art film moviehouse. So I went to see a movie I'd heard nothing about, but I liked the prinicpal actors. Guess what? Nazis! Dripfest! The world is lousy with 'em. Can't get away, apparently. Anyway, it was a gorgeous and sad movie. I kept thinking of Rocky Horror singing "I'm at the start of a pretty big downer!" 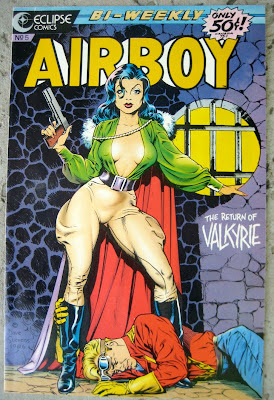 I'll prolly skip Valkyrie, as I'm not down with the Tom Cruise scene and all that, but if he made a movie appropriate to the comic cover at the right, I'd totally go see that movie. ...because i'm a masochist, that's why. We all know we have fashion horrors in our pasts, and we live daily putting such hideousness behind us. However, Facebook has found a way to keep the anguish alive and spooling out forever. Someone posted part of my senior class yearbook photo. I think considering how some other folk look, I bear up reasonably well. Still, this was my mullet. There were many like it, but this one was mine. 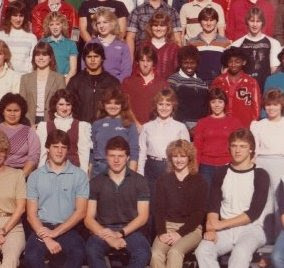 Blue shirt, second row. Do keep in mind I was a mere breath away from the choppy-offy punkette hair phase. 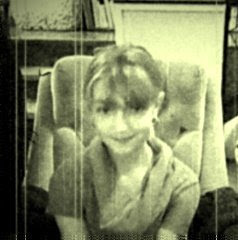 And yeah, my face is blurry - I never could be still. I know: I can hardly believe it myself. The Black Artists Association is chiding FLOTUS for not choosing any African-American designers. Isn't there something insulting about any group of people bawling like newly-weaned calves about the raiment of a woman who's only been First Lady for 7 blasted days? The mere fact that this group takes umbrage at MO's fashions seems to indicate they believe Michelle's husband-- at least in part-- is POTUS due to his racial makeup, and she should dance with the ones wot brung her. Ironic, much? I wonder if the Obamas take umbrage at such presumptuousness? They should do. I am pleased that in recent days MO seems to be making style selections which are more classic and elegant in nature than at times prior to the inauguration. She will have many hundreds of formal appearances over the next 4 years. I have no doubt that sooner or later, she's probably going to don she then her gay apparel designed by just about every ethnic group. Why should she be beholden to any group of designers? Why can't she wear what she likes, what fits her well and what she deems appropriate to the occasion? Why can't she choose her garments by the content of their couture and not by the color of the person whose name is on the label? Poppies! Poppies! Poppies will put them to sleep! We're told to shut up and fall in line because everything's sweetness and light. Mike-istan has a good post up about that very thing. This just in... TITLE FIELDS. I've been harrassed, so here they are. You know, I'm sympathetic to those folks who were led astray by ruthless investment hucksters, truly I am. The truth is that pretty much everyone I know of who has an IRA has been hard-hit by the downward caprices of the stock market, so the economic mess has been the sinking tide which lowers all boats. Ideally, most of those folks are young enough that if they continue to invest apace in their IRA, this can be a big building time for the portfolio of someone with at least 10 years to go before they need to tap those funds for living expenses[so long as no one hits the reset button]. But someone who lost millions? Jeepers. Doesn't everyone on earth know to diversify, and particularly people with that amount of dosh lying about? So the untold story is so-and-so lost millions, but what are their other holdings? Someone barely making ends meet supporting a family on $25K loses their job and they've got real problems. Someone losing millions in a stock scam is probably not going to have the electricity cut off at their ski lodge in Banff. I'm guessing the person who lost those millions will not be queuing up for a job washing the streets they used to own. After all- they are richer, smarter and better than pretty much everyone else, and what's the point of having all those advantages if they are not insulated from consequences in life? But, heigh ho! 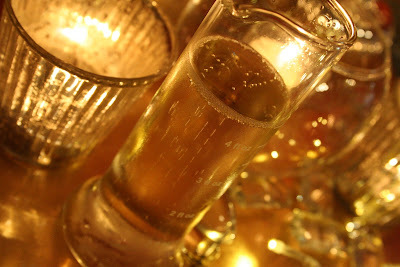 There's good news: there are lots of ways to turn it around and find the gleaming pot of gold at the end of the tunnel. Here's an article on MSN.com about how to turn your capital losses into a silver lining. It's called Get your Madoff deduction here! I'm not kidding about the title. Yet more evidence that if you lose on a real, skin-of-your-teeth level, you're pretty much ood-scray, but if you lose big-- well, that's everyone else's problem, including the skin-of-their-teeth folk. You can deduct almost anything, if you know the rules. Even body parts. Here's a golden oldie from several months ago. 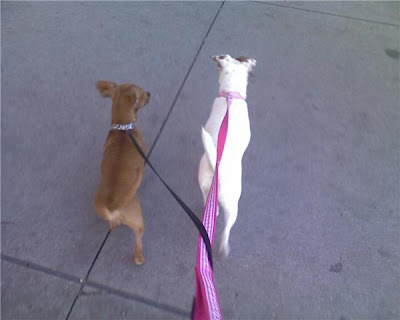 Chuy was still significantly smaller than Praline, and she was not full grown yet. Chuy was tarting it up, as you see. He is essentially unchanged. The Storage Space of Dorian Gray. I've been cleaning and organizing my apartment and hauling stuff off to Goodwill and throwing things out. Will I ever finish that paint-by-numbers zebra I meant to festoon with big red kissy lips? Probably not. Quilting? May get back to that- keep that fabric in holding pattern. Oodles of other craft projects? Nah. Let it go. I have been sorting through and trying to pare down my sprawling collection of possessions, but owing to living in a relatively small space, keeping some things in storage seems unavoidable. I seem to remember George Carlin talking about stuff. "...if you didn't have so much stuff, you wouldn't need a house" and "all a house is is a pile of stuff with a cover on it." Got that right. I cleaned like a fiend on Friday and got the place more tidy than it's been in yonks. There's also much less stuff here, owing to the departure of unstuffed and peed-on furniture, as well as basketloads of clothing that went to Goodwill. Someone might look at my apartment and think I live in a relatively tidy way (I do, actually) and that it never gets nasty in here (clean clutter is the extent of it). But even if someone esle thinks I'm Donna Reed, I know what's in the storage and it weighs on me whether I see it or not. I'm always thinking I've got to do something about all that stuff. I'm ready to be more settled in a slightly larger space (with more studio room) and at that time I want to be done with paying for a storage unit forever. I may not make it, but I call that a worthy goal, anyway. I've let go of so many objects in the last 6 months which I thought I'd never part with-- even so, why is it so hard to just let the impersonal objects go? I mean, you do have to have a certain amount of stuff to live, but more and more, the bits and bobs mean less and less to me. They say if you love something, set it free and all that bullcorn. Well, Friday I tossed away the boomerang sofa. Let's see if it comes back, but I'm not holding my breath-- I don't have room. When Praline had her transmission overhauled, I had them install a microchip thingie. When I left the vet with her, they gave me an envelope which I just came across Friday night. Turns out, you have to send in a $10 activation fee and also a $14.99 annual subscription payment on the microchip. I dunno why, but this sort of bugs me. I mean, what if they decide they want to charge $100 a year or something? They've already done the data entry and the info they store is a very tiny bit of information that's not charging them a whit to store - this seems a little disturbing to me. What if you moved and you didn't get your subscription update info, and what if your dog is lost - will they call your cell and say you have to pay a huge fee to get the info on the whereabouts of your dog? The annoying thing about this is that I invested $50 each in my two dogs to reduce the number of uncertainties about what happens to them, and now there's an whole new plethora of crap to vex over with regard to their well-being. Am I silly to have bothered? Could an amplifier be any cuter? I think not. 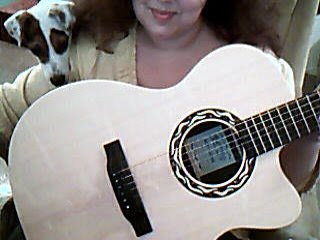 Santaself got me a Martin guitar with a gorgeous tone for Christmas and it's an acoustic/electric. 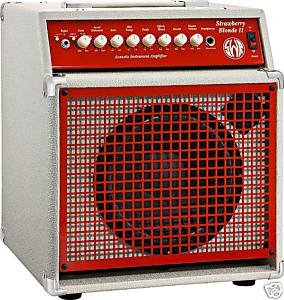 So, yeah, gotta get an amp someday, right? 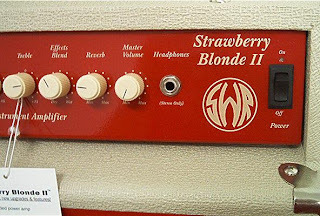 Anyway, I have no idea if it sounds good, but the SWR Strawberry Blonde amp is hella cute. The puppies are v. jealous of the guitar, by the way. They should be. The guitar does not bark unbidden and thus far has refrained from sullying the floor. Guitar does not drag twigs in to chew on the sofa. Guitar did make me cut my nails, however. Lovely Lin sent me this picture. Reminded me of someone I used to know. 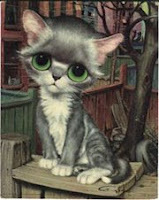 Yup: take away the black spot on the back and you've got the spitting image of my gal Valentine. 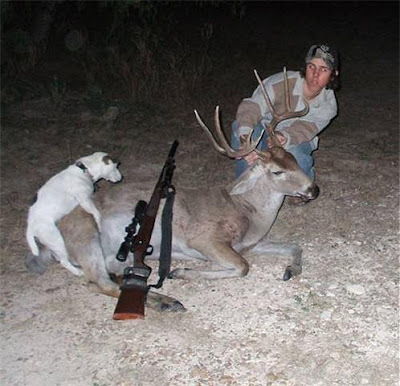 Nice of that dog to allow the human to take partial credit for the kill. You really must check out the site of Christopher Conte. 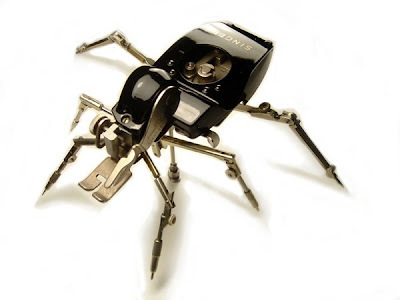 He worked in prosthetics creating artificial limbs for people (which he still does) and began creating steampunk delights in miniature like a microbotic housefly and the Steam Insect on the frontspiece of his main page as a hobby. Conte's unmanned attack helicopter is a little marvel. Stunning, meticulous craftsmanship. When I read his bio, I expected to see he'd been trained in jewelry design or watchmaking. Check out all the photos - lots of treasures to be found there. Those of us who use sewing machines will recognize the presser-foot maw of the Singer Insect pictured below. For elegance and sheer menace, the Black Widow and the Blue Widow are more sleek and streamlined, but I'm particularly fond of this wee beastie cobbled together from bits and bobbins of sewing machine parts. I have a confession to make: although I don't drink coffee, I adore the black shaken iced tea at Starbucks. However, I DETEST their pretentious pain in the arse way of re-naming cup sizes. Small is tall, medium is grande and large is venti. I mean, how Jim Jones. For a little while, I played their silly game. Yeah, I ordered the venti black iced tea, but I'm fed up with it. For yonks now, I always order a LARGE. I make a point of saying LARGE and I never use their brainwashy corporate buzzwords. They'll repeat the order back to me using the word venti, but then I'll say, "yes, a large, please." Now, while I have no desire to join the ranks of folk who consistently merit bonus ingredients in their food/bev orders at drive-through windows, I think on some level the barristas are sick of the Starbucks line of claptrap and approve of me bucking their little dog-and-bell system. So, it's all the more savoury when I pull up to the speaker and they offer me the lastest mocha coffee beverage with bleu-cheese foam topping to muster my best rubesoisie accent and order my iced tea. Make that a large, please. Tuesday I took the Hellpups out for extra long walkies. They are hilarious because though you can't tell in this photo, most of the time they walk in tandem like a little pair of draught horses. I found a huge empty parking lot to traverse and enjoyed the scritch-scritch-scritch of little nails filing down to nubbins on the rough paved surface. I really should invent an emery board treadmill for dogs. They can get their exercise and a trim at the same time- double-whammy style. Question: Does the Texas DPS CHL status site ever say anything beside Processing Application when you check on it? I'm feeling unsettled as though I left great swathes of information fields blank on the application, or something. 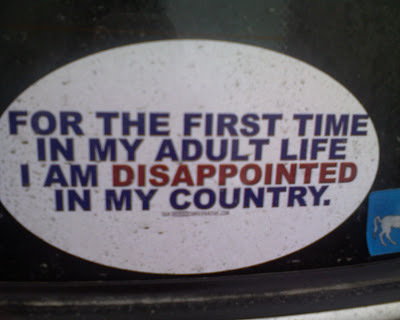 Funny, I think that about job applications I've submitted too. Now I'm realizing what the constant in all the above equations is. When I gingerly dipped my toe in the pool of housing management, I'd no idea I was embarking on a career in a growth industry. Actually, I didn't expect anything which might be deemed a career here, but so it seems to have turned out. I have long suspected that property taxes were a disincentive by the powers that be for individuals to own land and the improvements (structures) thereon. If I purchase a piece of land, I have no problem with paying a one-time tax at the time of purchase for the transfer of title, etc. I recognize there is infrastructure provided by the city/county/state/utilities which make my land usable for whatever service I should require from roads to utilites. Why can I not pay for the particular services/repairs to my property on an as-needed basis? Rather, however, than have a tax on actual usage, these taxes are often bundled together in the form of annual tax on the property which are monolithically levied against all private property owners. If I fail to pay taxes on a property I legally own, the government can legally take it from me. In other words, by virtue of what they term taxes, I am permanently renting my land from a government which has the final say in its value, disposition and monies owed. I am not saying that I will never again own property, but I will be paying annual taxes on same begrudgingly. Such arrangements make very long leases from private interests sound more appealing by the minute. Come to that, as more and more residential properties revert to banks who hold the mortgages, and as more and more of these banks are owned by the federal government, I see in the road ahead a tipping point at which our government will become residential landlord to millions in fact. After all, people need to live somewhere, and houses left empty fall apart and lose their value more quickly than houses which are occupied. The compromise of renting out the millions of empty houses will be the only real option for the government to protect their "investment" in these structures, with the toothsome fringe benefit that the government will have even more purview over the people who live in those houses. Remember that a landlord has a fiduciary duty to protect the interests of the property owners they represent, and if you read your residential lease carefully, you will see that at any time, the landlord or property maintenance can legally enter your residence for any reason which may involve concern for proper mechanical or systems operation in your apartment/house. I'm not saying the powers that be would have their landlords and ladies misuse that right to enter a private residence, but I'm also saying that until the powers that be have an actual face, name and mailing address, I'm not going to ascribe to them the moral high ground when it comes to respecting the right to privacy of every American citizen. Call me cynical. All the while I'm asking myself who are the powers that be I am also wondering how do they benefit from a mere lowly person like myself being financially compromised? Why do I have a staggering fraction of my paycheck confiscated and then I have to pay additional taxes from the change that's left over from the dollar I bloody well earned through my own sweat and ingenuity? More rental houses mean more landlords and landladies. Considering the necessary degree of strict regulation (in other words, no real opportunities to manage and make decisions, coupled with the possible horrid potential for violaiting the rights of others), I'm guessing Landladies of the Electric variety need not apply. Not that an Electric Landlady would want the job. Oh well. Time for a change, anyhoo. I can't believe anyone's doing this. Moreso, I can't believe they will actually get away with it. 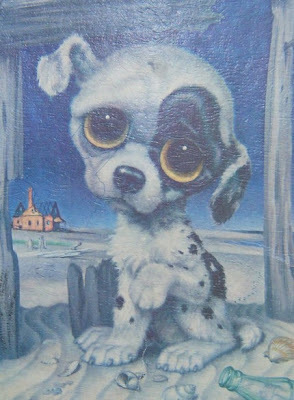 When I was a little kid, we had these pictures on the wall with a puppy and a kitten in litter-strewn alleys on cold dark nights with big, impossibly round and sad moist eyes. Sometimes I'd lay awake and cry about those poor little fellers. So, anyhoo, I'm older and wiser now and it's been many years since I've known what a silly inclination that was and and since I've been able to laugh at how preposterously gullible I was. Now Chuy looks at me like that sad puppy. Is it the wrinkles? Is it the moist cow-eyes he makes, the whites visible at the edges, plaintively panting his bad breath in my direction? I'm such a sucker. Something interesting happened at work Wednesday. A resident came to my office and said this was the best place she's ever lived and that she loves getting the memos and newsletters we distribute. She said they were informative yet personable that she felt like they were written specifically for her. She asked if I wrote them and I said I had. The conversation continued and she said that she might be able to use my writing in some of the copy at her PR firm. Anyway, I said I was moving away from Dallas soon, and she said I could do the work remotely from pretty much anywhere. Anyway, it was a massive compliment, and from one of the residents whose style and mien I most admire. I do generally think of the residents as my baby chicks, and I want them to feel they are cared for, and it's nice to know that my communiques have conveyed that. No, they don't need to be perennially juvenile or such, but I feel that part of what I am paid for is caring about these folks coming home to an hospitable and welcoming property where their concerns are properly addressed. Anyhoo, we'll see if anything comes of it, but at the very least, it made me feel appreciated and that's a pretty nice thing. You may not know it, but this is one of the coolest people on earth. She's so clever and talented, and one of the people I admire most. You should hear her play Hungarian Rhapsody-- her long fingers are so elegant and she has the nicest, most delicate touch, coaxing sound from the piano rather than demanding. Today she's 12, and I couldn't be more proud of her. If I ever have kids of my own, I will always think of this girl as their big sister, because even though she's my niece, I couldn't love any human more than I already do her. Amazingly, Tuesday night marks three consecutive nights the pups haven't slept with me. So, anyhoo, instead of the usual protracted settling down ritual they've been doing in bed nightly, left to their own devices on the main floor, they simmer right down and go to sleep. Sleeping through the night is something I think I could get used to. I don't give a rat's arse if Oprah has on one of her many properties worldwide actually located the very Fountain of Youth, I bloody well don't give a toss and don't want to see references to it in my email account!!! Whoever sends this thing out, I'd like to stab them in the neck with a pencil. Couldn't we just go back to offers to enlarge my manhood? Playing Tetris helps relieve Post Traumatic Stress Disorder. A team of Oxford researchers has found that moving the blocks around on the Tetris grid helps engage the part of the brain which retains bad memories. Hmm. I used to play that a lot. And I thought I just like the little song. Here's a building used as a field for a Tetris game and controlled by a mobile phone. FUN! Together again. Saturday was wild but good. I have been having some difficulty in loading phone vids to my pc. Will keep working on that. Praline's wound is not bad and she's leaving it alone and it seems to be healing nicely. 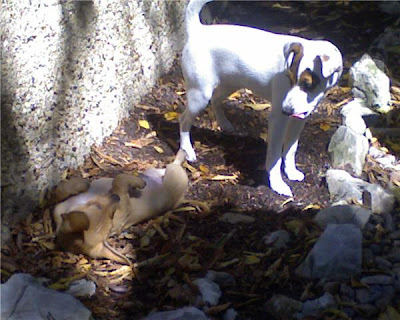 The pups had a happy reunion, but I think he was puzzled by the different way she smelled from usual. They're playing and she's bouncing around and wiggling, and she's jumped up on the dining table and on all the furniture. The stitches seem to be holding, though. I hope they'll go to sleep quickly. Post-op or not, momma WILL kick them out of bed. Chuy and I had a splendid day Friday running errands and we even had a big shopping blowout on toys and treats ($45!) at Petsmart. [oh, and one very good pair of nail clippers] He was quiet and I could tell he still missed his Sissy all day, but he managed to have a good time and seemed happy to be along for the ride. 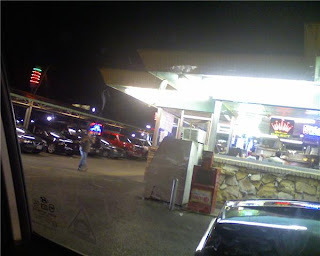 At the end of the last errand, we went to Keller's drive-in on Northwest Highway for a burger and tater tots. All these years, and I've never been there before. One side of the cook shack was dominated by dozens of bikers. A carhop comes by and takes your order and then puts a tray on your window just like back in the day, and your food arrives with lightning speed. They also serve beer. I don't know how they get around the open container in a vehicle thing, but it's neat, if you're a person who's not impaired after one or two, I expect. Or if you happen to be the designated drinker in the car. I sat there and thought how neat the place was with its Jetson neon and suddenly, the juke box cranked to life. Almost warm & sultry night, eating a burger while my dog sits in the shotgun seat. Kenny Rogers' The Gambler came on, and I never liked that song so much. I sort of thought all those years of being tired of that song are kind of worth it for this moment when that song really fits a time, place and mood. It was kind of sweet. Then the song ended and no other played. That was Kenny's moment, apparently. Fair enough. This place is marvelous. Good, basic burgers. I munched happily on my burger with a paint-peeling onion snugly ensconced, most of which I ate. Mr. Chu-man-fu sat patiently and watched. His good behaviour was rewarded with little nibbles of my poppy-seed burger bun and little cheesy bits of beef. I like the mom/boypup day. Praline is such a live wire that he doesn't get these contemplative days, generally. I know he was content, but he would have preferred the rough-housing. Oh well- in 7.5 hours we'll be picking up my little barbwire pineapple from the vet's office. I'm going to video their happy reunion and will try to post it. I know it will be a lurve fest. Pupgirl is nicely on the mend by now. She's still at the vet's office and I'll be able to pick her up first thing on Saturday morning. Thursday morning about 2.5 hours after I'd dropped her off, the vet called me and said she had fared well in the surgery, was coming out from under the anaesthesia and was already her naturally silly self again. I hope she doesn't wiggle out of her stitches! Anyhoo, she's all fixed up and in fine fettle. Chuy, on the other hand, has not fared so well during this separation. He's been desolate, tragic and utterly bereft of his joy since his sissy left Thursday morning. I had to be out of town all day, so my sister took him to the office and let him hang out with her. He looked out of the window and whined most of the day. Poor little lad. I shall keep him with me all day Friday and hopefully the time will pass quickly. Mebbe a nice long walk? Looking forward to their happy reunion. Don't you hate when you catch yourself blurting something stupid and trite? You never do that? I got pulled over Thursday morning for not stopping far enough behind a stop sign. I said "I'm sorry. That's a cliche, isn't it? You hear that all the time?" I said "well, I rarely get pulled over so I'm not rehearsed on non-cliche comments." Someday, perhaps I'll learn to keep my mouth shut, but I'm not holding my breath. Monteverde Invincia Fountain pen. VERY pretty. I've always liked dip pens and quills, but Santa obviously thought I needed a proper fountain pen. Good call! Got a converter and drew some of my best green Italian ink into the converter cartridge and had a little doodle-fest. This pen writes beautifully. Sometimes I feel the need to write Tra la la la la la la la la la la la la la la la la la la la la la la la la la la la la la la la la la la la la. Can't hep it. Note to self: sloshing ink all over your fingers will pull focus from the crap manicure you gave yourself. Double-whammy! YAYS! I'm off for 4 days. Will post a Praline update when there is news to tell. I'm sure she'll be fine, but I'll be much happier when it's over and I'm writing the check and taking home my teeny tiny toastie. Miss Praline is going for her *ahem* alteration today. I can't believe my girl is old enough for this, but that's how time passes, I suppose. She was such a wee little thing such a short while ago. WOOPSIE! ENTERED THIS ON ME CALENDAR WRONG - is tomorrow. Poor little Chuy emitted the most pitiful, plaintive mewling when I took Praline and left. Will take him with tomorrow - poor little lamb. 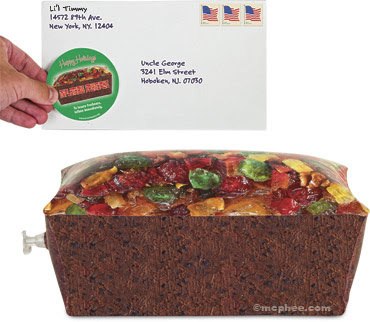 Inflatable fruit cake. Ach! NOW you tell me. This years Christmas shopping: DONE. "if I had to pick one thing to take to a desert island, it would be inflatable fruitcake." You know, I really hate to rag on Madonna, and yet, I don't. Most likely she didn't micromanage the editing of these photos, but see how the line of the tile floor is skewed when they shrunk her right calf to a withered, concentration camp proportion? Good googly moogly. She was already scrawny. I've said it before and I'll say it again: if Madonna were a piece of fried chicken, she'd be the last one left on the platter. She'd be selected after the skinny wing with pinfeathers. Wow. Nano-diamonds found in a layer of sediment suggest mammoths were killed by a comet-impact. Minuscule diamond fragments found in a sediment layer dating from thousands of years ago are bolstering the theory that a catastrophic comet impact wiped out many forms of life in North America, including what are thought to have been the first human settlers of the continent, the so-called Clovis people. The nano-diamonds are buried at a level that corresponds to the beginning 12,900 years ago of the Younger Dryas, a 1,300-year-long cold spell during which North American mammoths, saber-toothed cats, camels and giant sloths became extinct. The Clovis culture of American Indians also appears to have fallen apart during this time [Reuters]. Apparently a thick fur coat is not heavy enough for a nuclear winter, eh? Saturday Buck emailed me a link to this stirring essay on why old dogs are the best dogs at the WaPo. 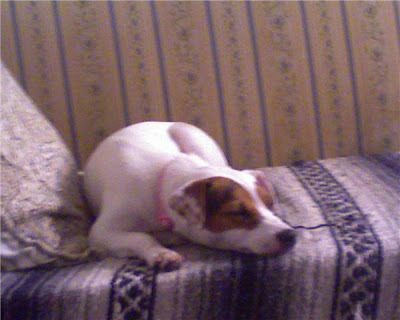 I sat down late last night to read the article, and I thought of the little old lady dog I lost last year, Valentine. Not long after losing Miss V, I got another pup. Praline's a wigglesome, swe et little Jack Russell Terrier who lifted my spirits tremendously. A dear, dear friend told me I needed to get a second dog soon to complete my little pack. 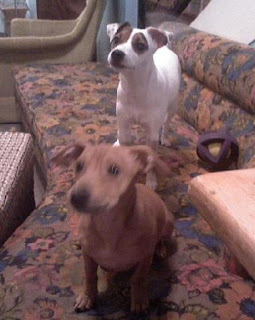 A short while later, my vet told me her colleague had rescued some chihuahua wiener pups- the two breeds I swore I'd never own. So Praline and I met Chuy and it was lurve. Praline is smart, but she's so excitable that it's easy to think she's not really paying attention to what's going on around her. Chuy, on the other hand, knows what's going on with every creature in the room. I read the article mentioned above, and at the end, it brought back the memories of the last days with the doglet. I admit I cried a little. Not racking sobs or anything, but a few tears escaped the banks of my eyelids. Suddenly, Chuy was right there in front of me, his cobby little paws resting on my knee as his earnest face looked up in to mine. I picked him up and he snuggled up to me and he nestled his head to my neck. I know it's odd, but it really seemed like he knew what I was thinking and was trying to comfort me. Saturday I drove out of Dallas with the morning sun in the rearview. I listened to Our Love to Admire by Interpol for the first hour out of town. My favorite music is always a comfort to me as I think of the future. What am I considering doing? I've yearned to leave Dallas and be Elsewhere. How will life change? How will I change? Then I popped in Coldplay's Viva la Vida, which I just purchased recently but hadn't really listened to, other than the delectable earworm that's popped up all over the place. Songs opened with full gospel organ to plodding beats, Chinese dulcimer strings sprang blossoms of sound which seemed to pulse in time with a flurry of birds over the road ahead, wings flashing as the flock contracted, expanded, then turned of one mind. A train of coal cars passed with their loads piled in impossibly symmetrical forms. Dry native grasses swayed in the wind, their stalks ranging from gold to rusty pinks, looking like velour in the sunlight under a cloudless sky. Funny how pretty something so banal can be if you take a moment to really look at it. I've found a job listing in another city in Texas, but in the same industry. I'm pulling my C.V. together and applying this week. The administration in the company I'm applying with is a slow, plodding thing, so I expect if I get an interview, it'll be more than a month away, and if I should land the job, then that'd be as much as 2 or 3 months away. I've been to that city before and liked it and the surrounding areas, so I moseyed out to check it out more closely yesterday. Moving from Town in this information-saturated age is a different prospect than 20 or even 10 years ago. I maintain a few close friendships, but I can do so as easily from another town. I don't see my friends every day, so no reason why I can't just make the effort to drive a few hours to see them every so often anyhoo. With a phone call or the click of a mouse, I can have pretty much any exotic product I could wish for delivered to my door in relatively short order. All things being equal, the charm of being in a big burgh is pale compared to that of a place where I could feel safer in my own home and not be wakened by the sound of expressway traffic at 4 AM. I found a charming town of which I'm exceedingly fond. I scheduled an appointment to see a house, and a little corgi marched resolutely up to greet me as I waited for the realtor to arrive. I looked around and saw lots of nice trees, and some of the houses had that adorable Swiss Miss edging along the rooflines. Very cute. It turned out the nice older gentleman realtor was the builder of the houses in that neighborhood in the 60s. I met some more lovely folks who live on the street, and I really like the the neighborhood. It's quiet with nice families and perhaps they wouldn't mind having an eccentric artistic type living on the street? Anyway. Dallas is a lovely city in many ways. Fantastic shopping abounds, and there are so many great restaurants and galleries in town. Lots of fantastic live music may be heard here, and that's always been a big deal to me, but I find it's less satisfying than it once was. If I move, and there's a show I really want to see, I can always come back to the area and attend the show with Holly and spend the night with her. I can always just buy the CD anyhoo, right? Living here has been wonderful to me in so many ways, but it's time for something different. I don't expect ever to live here again. This has been sweet, but my life is not about being in this place. Hang on tightly; let go lightly. This is all very chicken-counting and early days, of course, but if things do move forward, they will do so at avalanche pace, and for once in my life, I'm preparing for possibilities, instead of procastinating and crossing my fingers. If I don't get the job I really want, I'll keep trying until I land one that works for me, and I'll be certain the job I landed was the one I was meant to have. After all, I'm working to live, and not living to work. Lordy! My load is heavy. You see what I have to put up with? Snortal combat. Okay, you've gotta wait for it. The sound on the vid is right crap, but the snorts are there at the very end. Puppy fisticuffs. So, the dogs do this nearly-silent tussle on a nightly basis. They thrash and wallow all over the bed and usually after a few minutes of the snarling buzzbomb antics and snorty combat, they'll simmer down and Praline'll divebomb under the covers and curl up at the back of my knees and Chuy'll lie close to the front of my calves. USUALLY. I've thought many times I erred in letting them sleep with me-- sometimes they are rowdy and take forever to settle. Then again, I'd consider confining them to the downstairs of the loft for nighttimes and I could actually feel my eyes brimming with tears just thinking of the bewilderment of my sad, lonely and cold little puppehs, thinking momma abandoned them and just don't love 'em no mo'. Well, Thursday night was a major bear for me. Went to bed SO tired. Worked 13 hours on NYE, and all this without the restorative effects of booze. Honestly, I could've filled a liquor cabinet with all the booze I was offered while on property Wednesday night, but I behaved. I was working and needed a clear head. SO, by Thursday night I was wiped out, and then the leetle darlings started their rowdy floorshow on the bed, but they just never would settle down. Probably after drifting off several times and at least 20 minutes, I got up and moved the gate barrier from across the closet opening and put it across the stair entrance. I popped she-fiend Praline down on the other side of the barrier and collected Chuy from the bed and set him on the other side, too. I climbed back into bed grousing and fuming, but fully expected crying, whimpering. Sad, sad babies! Instead, they barreled down the steps and continued their romp around the apartment. I drifted off into sleep and awoke about 8 hours later, totally refreshed. Hunh. I think those brats have been waking me up at night. I've been played. They're just using me. We're going rinse, lather and repeat, I think. I was fortunate to have occasion to talk to a little old lady recently. She was very sweet and spoke in a warm, clear voice as her mind cast back to her younger years, and days which must seem more present with her than a moment a few hours ago. She knew what she was saying and this was clear, but sometimes, she'd hesitate an instant as she flipped through her files to produce the apt word to come next in the sentence. She is meticulous in her language, erudite and well-spoken. I held her hand as she spoke, and she smiled at me and said my family had been kind to me, that my coloring and features were lovely. She looked into my eyes and we chatted quite a while, mostly her speaking and me listening. What a rich and interesting life she has had. And a good one- one in which she can take great pride and comfort. I said how lovely her hands were. Her fingers seem impossibly tiny and are quite elegantly formed without the signs of arthritis which seem so common in the hands of the elderly folk in my own family. I thought of my own hands, and how the rigors of my leisure pursuits seem to have taken their toll on my little mitts. Nails very short for my new guitar practice. Years of flower gardening, working with wire and tools in jewelry manufacture and of course, the shooty arts wot am hell on a manicure. Still, I like the way my hands look - the hands of an artisan. My hands say I am capable, and I like that. But I look at her hands and consider the X number of decades she has on me - hers still have a look of refinement which age can not mar. Her hands say who she is: a Lady. She said she'd been a pianist and people loved watching her play and always commented on her pretty hands, and that she'd considered being a hand model. She chuckled. She looked at my left hand holding her left hand and raised her right hand, turning it in the light, considering. Her fine skin is corded with vessels draped over her bones under too-thin skin. 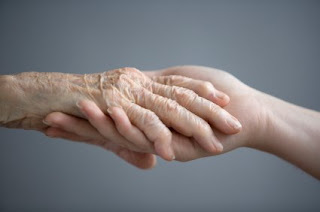 The lines of her hands are beautiful and yes-- they show her age. She looked at her hand a moment longer and then pointed to her own left hand and said "this is what your hands look like when you're old and ...bony. And this [now pointing to my hand] is what your hands look like when they are young and..."
I waited for the word, knew it would be a good one. We both threw our heads back and laughed. Happy New Year, you fabulous people!